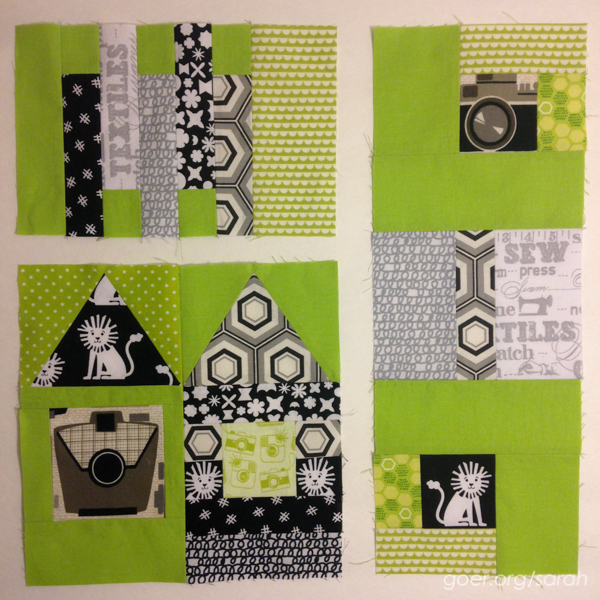 I'm participating in the Patchwork City Metro Block of the Month with The Intrepid Thread. 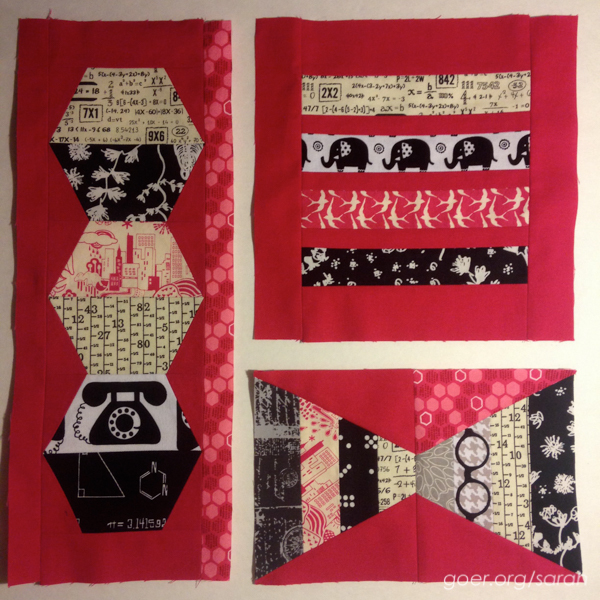 It started in February with fabric to make two blocks each month. 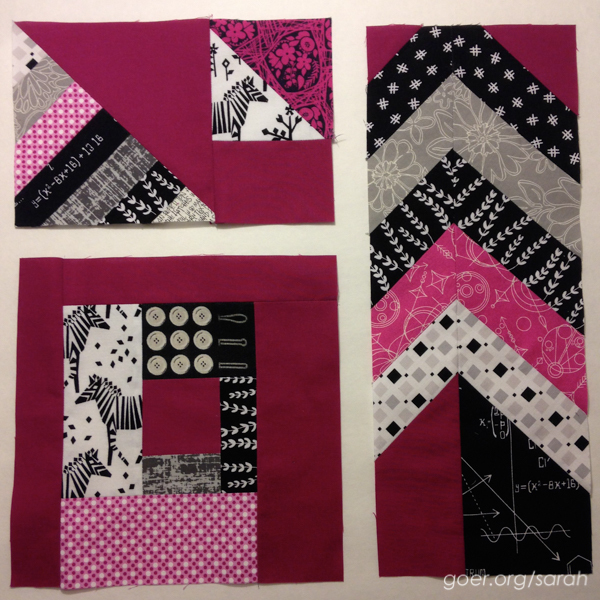 At the beginning of April the fabric was piling up, as I'd only pieced part of one of the first four blocks. 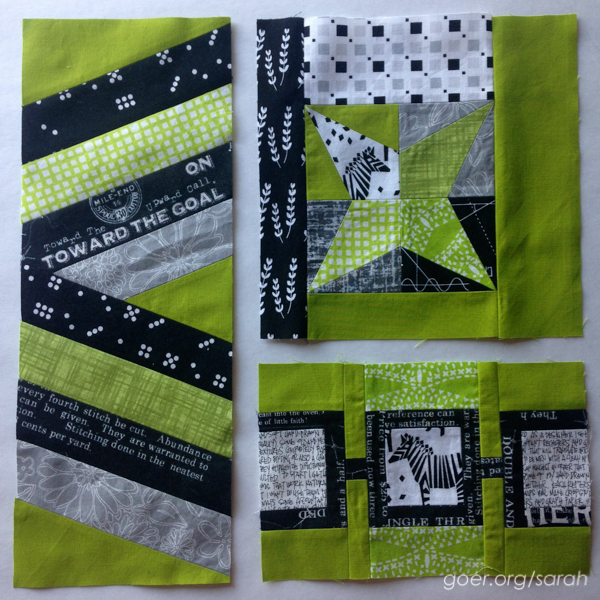 So my April goal for A Lovely Year of Finishes was to get caught up on my blocks. 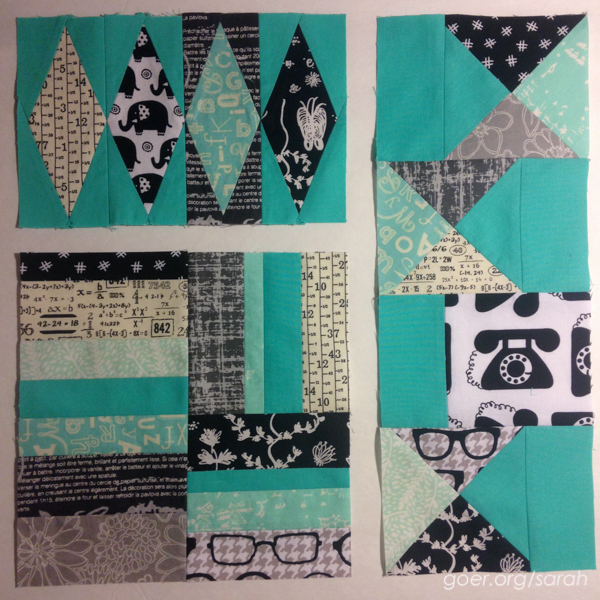 This month I finished all six blocks! I'm having a great time with this project and think it will be easier to stay on track now that I'm caught up. I'm finding the freezer paper method to be working really well for me an I've only had to rip out a couple rows of stitching (namely on those turquoise diamonds). ;-) Thanks again to ALYoF for giving me the push to get it done! P.S. Tomorrow sign ups start for my Halloween Mini Swap on Instagram. You can see all the details here and find me @sarahmgoer on IG (where I'll be posting the sign up link) if you'd like to participate. Linking up to ALYoF April FInishes Party and Needle and Thread Thursday. Posted in Quilting. Tags: ALYoF, BOM, Patchwork City on April 30, 2015 by sarah. Welcome to those of you who are here to share a finish with TGIFF or to check out what everyone else has been up to. I'm excited to be hosting Thank Goodness It's Finished Friday! 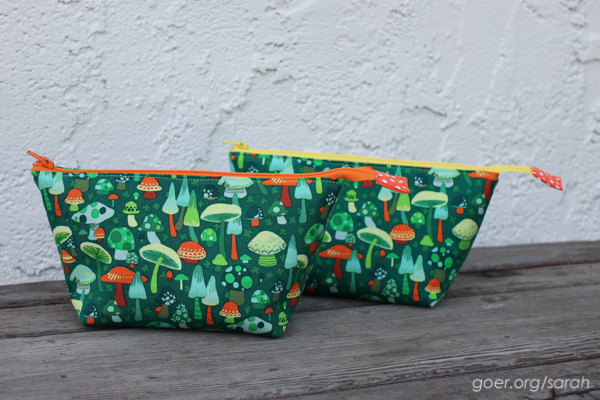 On Tuesday I showed you my first little Open Wide Zippered Pouches. I think I could easily become addicted. (There will certainly be some made as gifts soon.) Such a nice fast project! 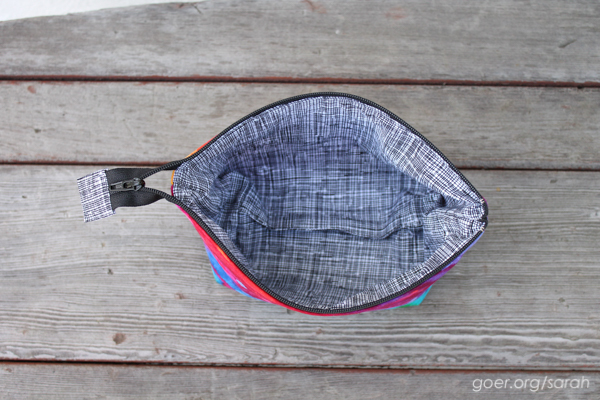 Participating in the Open Wide Pouch Swap on Instagram was a lot of fun. I've really enjoyed watching people share their creative ideas. I'm looking forward to the arrival of my package. I knew that I wanted to piece the outer panels for the pouch I was sending to my partner. And, how can a person go wrong with Alison Glass fabric? So I used the her Mercury prints and designed a rainbow panel for the outside. I have to say, I'm kind of in love with it and it was really hard to send away. 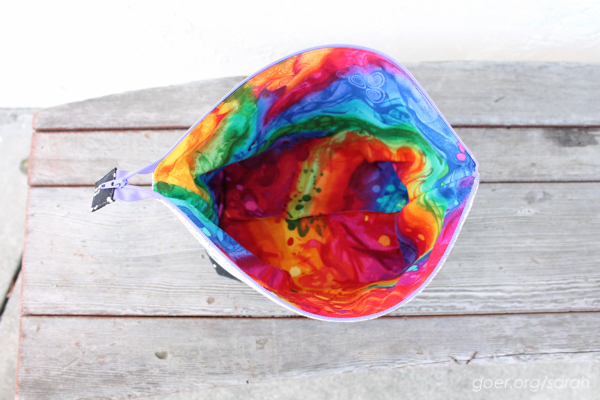 Perhaps I will make myself something similar. 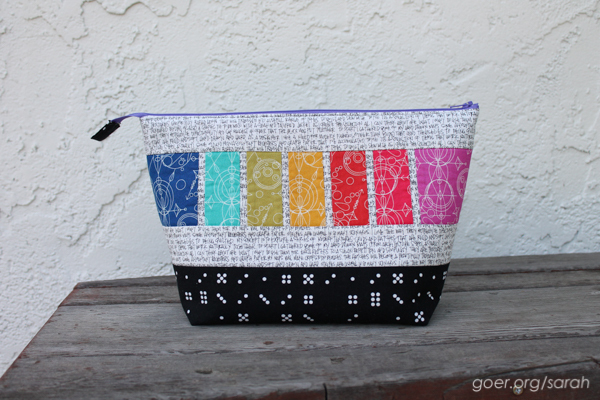 The pattern from Noodlehead has three sizes and includes measurements for a pouch with one fabric on the exterior or a pouch with a contrast bottom (two exterior fabrics). 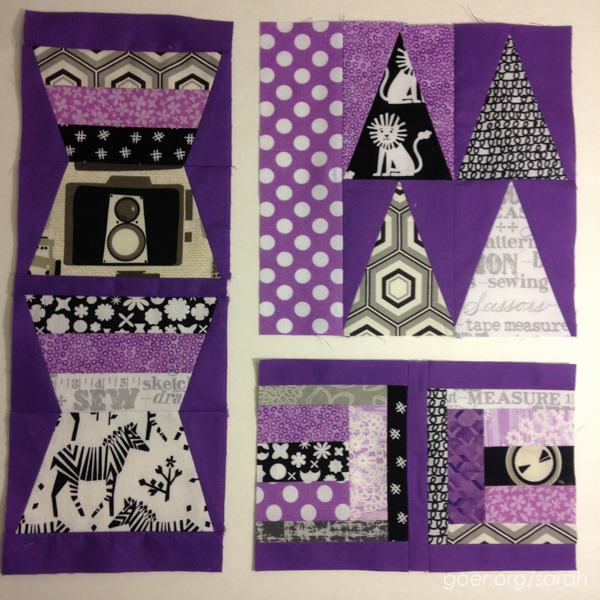 I started with this option but knew I wanted more "work room" for the piecing in my upper section, so I made my contrast bottom pieces smaller (5.5" tall) to accommodate this change. This left me 6.5" by 14" (unfinished) for my upper section. I don't have process pictures/diagrams, but here are my measurements for the upper portion of my pouch (for one side). The upper (attached to the zipper) text piece is 14" wide by 2" tall. 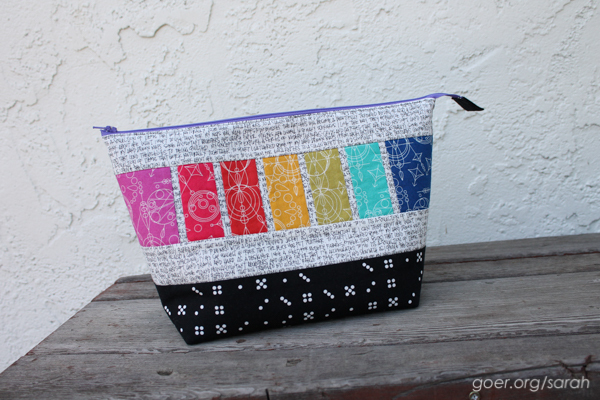 The lower (attached to the black print *with a 1/2" seam allowance*) text piece is 14" wide by 2.25" tall. The pieces for the rainbow panel in the middle are 3.25" tall. The text pieces are .75" wide; the 5 colored panels in the center are 1.75" wide; the blue and pink end pieces are 3.5" wide. When I pieced them I pressed the seams to the colored pieces with a 1/4" seam allowance. I trimmed this strip to 14" once it was pieced. Then I attached it to the upper and lower text pieces with a 1/4" seam allowance. From here I continued with the directions on the Noodlehead tutorial. Posted in Sewing. 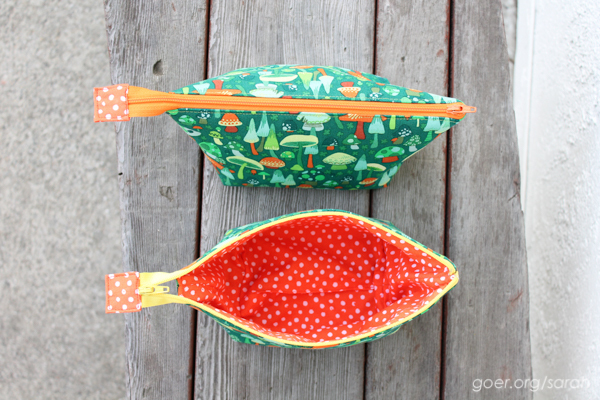 Tags: open wide zippered pouch, TGIFF on April 23, 2015 by sarah. 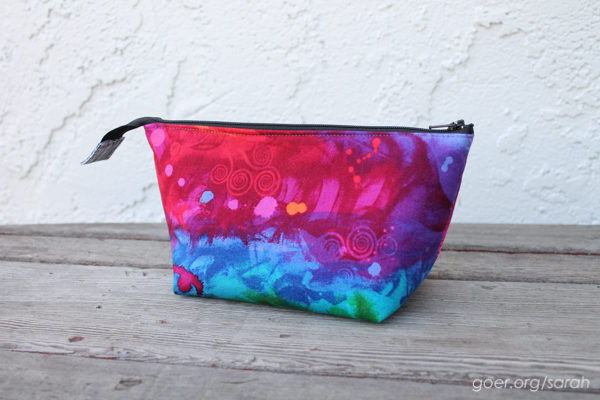 I used the Open Wide Zippered Pouch Tutorial from Noodlehead. The tutorial is great. Easy to follow directions with lots of detail and great photos. And measurements for three sizes! The pattern recommends Pellon 101SF interfacing, but some discussion on IG included the suggestion to use fusible fleece (Pellon 987F), particularly by people who wanted their outer fabric to be quilted (which I planned to, but ended up not doing). So I made one of each and I'm happy with either option in this size, though if I wanted to quilt the outer panels, then the fleece option would be my pick. These first two are the small size and I kept them simple, just using a single fabric for the outer panels. 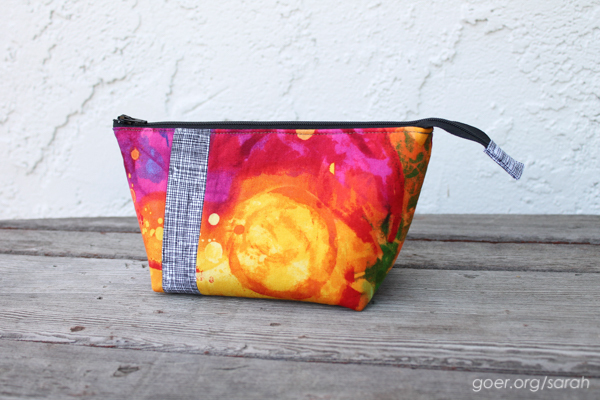 I look forward to showing you my fancier, pieced, large pouch on Friday. Please visit Friday to link up your latest finish when I host TGIFF. Posted in Sewing. 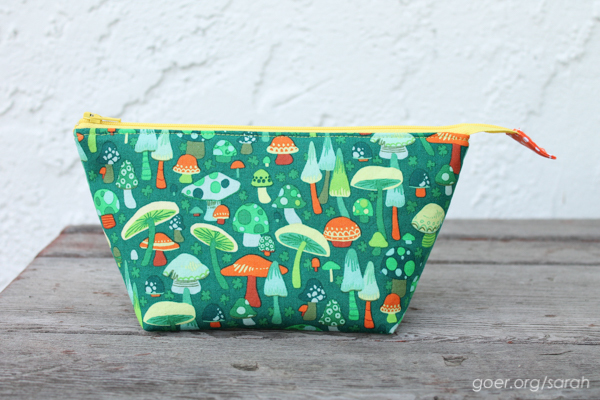 Tags: open wide zippered pouch on April 21, 2015 by sarah.